are known for their wide variety of music, catering for all ages, entertaining with style and bringing the right atmosphere to your event or special occasion. Equally suited to chilled background music on a Sunday afternoon or to a venue with a crowd eager for a sing-a-long or a dance they can play a wide variety of favourite songs in their own unique style. If you’re looking for something extra and your budget allows it they can expand to a trio bringing in bass guitar or drums. Having played at Gourmet food and wine festivals, weddings, corporate functions, birthdays and Sunday sessions in pubs, the KT Buzz duo are highly professional yet fun and relaxed. Katie Buzz has outstanding & versatile vocal ability enabling her to perform all types of styles. She has performed extensively over the past 15 years in and around Adelaide and interstate. 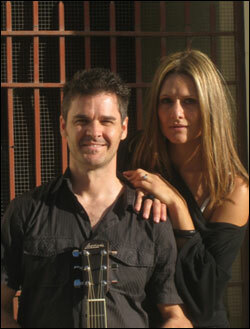 Matt is trained in both classical & Jazz from the Adelaide Conservatorium. He is an extremely talented and musical guitarist with 20 years experience. Feel the buzz, book the KT Buzz duo today!